Well hello hello! I'm back with another What I Ate In A Day post, which I've been sharing with you every Tuesday (you can check out last weeks' post here)! I follow a vegan diet/lifestyle, so all of the foods that I'll be showing you today are meat, dairy, and egg free. As always, I drink a ton of water throughout the day! I spent this past weekend visiting my best friend in London, Ontario, so this is the type of food that I eat while travelling. I started out my day with a green smoothie - which is pretty easy to make as long as you have a blender. I got the recipe for this Classic Green Monster Smoothie from the Oh She Glows Cookbook, which I bought recently and I'm already obsessed with! This smoothie combines spinach, bananas, almond milk, peanut butter, chia seeds, vanilla, and cinnamon, but all you can really taste is the peanut butter! Smoothies are a great way to get your greens into your diet, and I'm just recently delving into the world of green smoothies. For lunch we went to an all vegan restaurant in London Ontario called Veg Out, which is unfortunately closing this Spring! 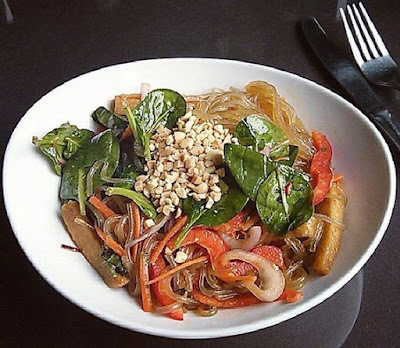 I ordered the small Thai Style Glass Noodle Bowl which included sweet potato glass noodles, tofu, fresh veggies, peanuts, herbs, chilies, & ginger lime dressing, and it was seriously good! My friend ordered a vegan poutine made with Daiya cheese and a mushroom gravy, which was also amazing, and I did help myself to a few bites of that! Finding restaurants that serve vegan options can be a bit tricky while travelling, but my secret weapon is the Happy Cow app. I always use this while travelling, and it's great for finding nearby vegan, vegetarian, or veg-friendly restaurants. This app was a lifesaver when we were in Europe! To tide me over between lunch and dinner I snacked on an Asian Pear and a Small California Navel Orange. If you've never had an Asian Pears, you've got to try them out! They're crunchy like an apple but so juicy like a pear! We had dinner reservations at Toboggan Brewing, which had a handful of vegetarian items on the menu. 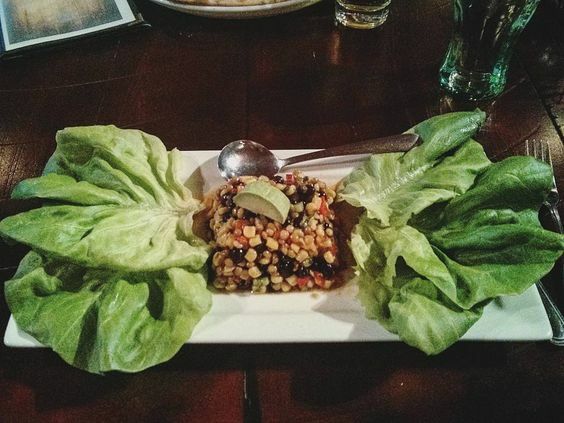 I ordered the Vegetarian Lettuce Wraps, asking for them to be made vegan, which the waitress said was no problem at all! The filling was marinated lentils, black beans, sweet corn, avocado, celery, peppers, and cilantro. This was actually my first time having lettuce wraps, as I'm not afraid of carbs and I enjoy a good proper wrap. Without the carbs from a traditional wrap, this meal wasn't too filling, but it was still very yummy. After dinner we went out to karaoke at a local bar, and then finished off the night with some Lay's Classic Chips, which aren't healthy at all but they sure are delicious! I hope you enjoyed learning all about what I ate while on vacation in London Ontario! I think that I still managed to stay pretty healthy while on vacation, which can sometimes be a bit of a struggle. I really love sharing all of my vegan food with all of you! What foods have you been eating and loving lately? Check back next Tuesday for another What I Ate In A Day post! Wow, everything looks amazing! So great that you could find vegan options while traveling!